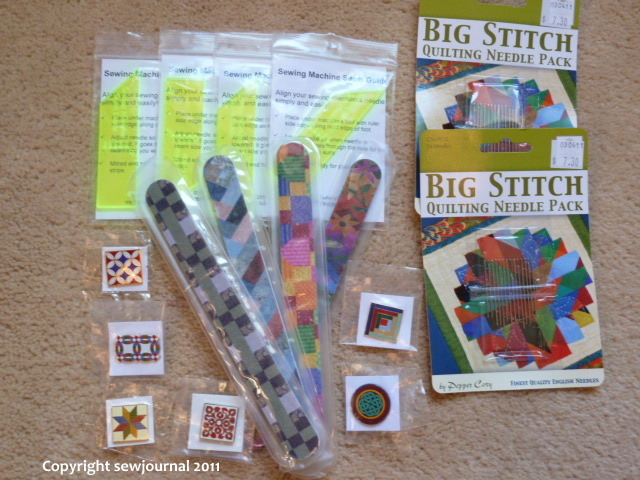 When I was in the Gaithersburg Quilt Shop – Capital Quilts – I bought some goodies to bring home as presents. I bought some emery boards with quilt patterns on the front and some lovely enamelled pins with quilt blocks on them. I bought two packets of Big Stitch quilting needles. As you know I’ve really taken to this style of quilting and my friend Di has too so I bought a packet for her too. I also found a really useful little tool called a CutRite Sewing Machine Seam Guide. That’s the little green ruler you can see in the photo. It has holes in it where you situate your needle and then you can mark against the straight edge with masking tape, a strip of moleskin or reusable silicon strip to mark the required seam width. You can position the needle for a scant 1/4″, 3/8″, 1/2″, 5/8″ or 3/4″ seam. The ruler also has markings to 1/8″ and the 45-degree end can be used when piecing binding strips together. You’ll never guess what I did though! (or perhaps knowing me you will 🙂 ) I thought I bought 5 and so I gave 4 away as presents only to get home and find I didn’t have one myself. However, I’ve found the website and you (and I ) can buy them here. 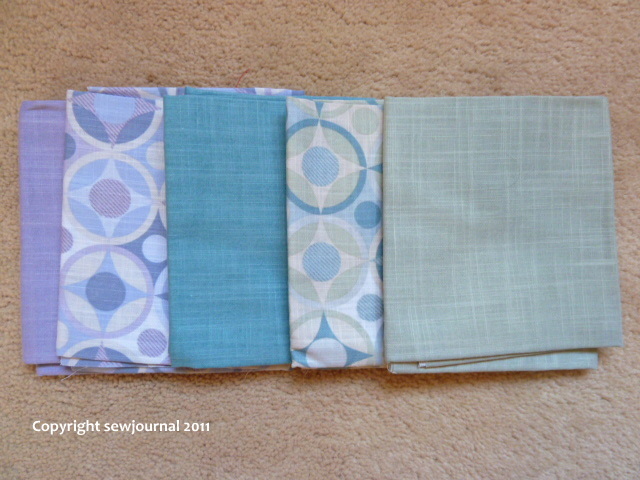 In addition to gifts I bought 5 fat quarters in soft lilacs and turquoises. Aren’t they lovely?